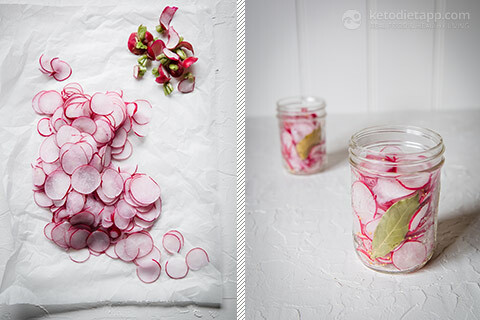 These pickled radishes are the perfect combination of sweet and tangy. Put them on the side of just about any meal to bring a touch of pretty crunch to the dish. And seriously, put the jar in the middle of the table because how perfectly pretty are these? Enjoy! 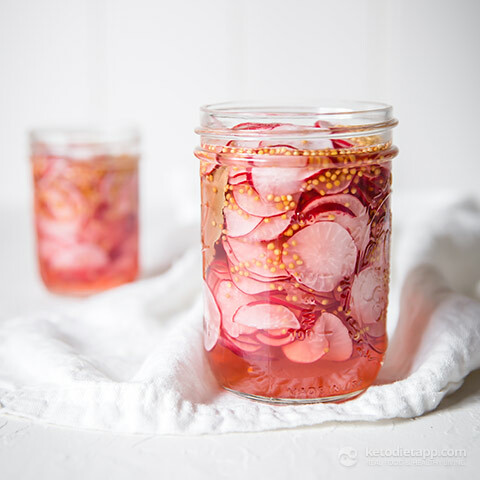 Using a mandolin or very sharp knife cut the radishes into thin slices. Layer the slices into jars. I used two wide mouth pint jars. Place a bay leaf into each jar. I also sprinkled extra mustard seeds into mine, but in hindsight they really weren’t necessary. 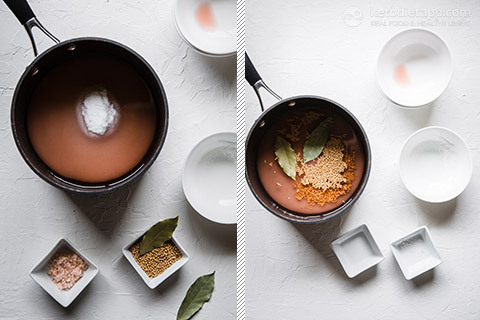 Place the vinegar, water, sweetener, salt and mustard seeds into a saucepan and bring to the boil. 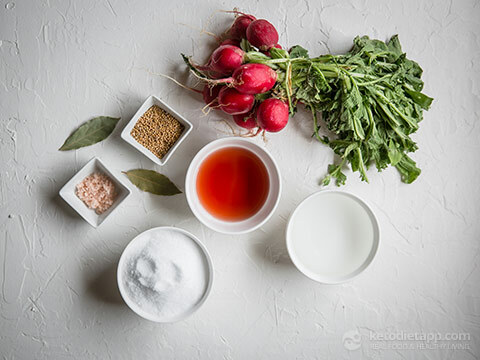 Very carefully, ladle the hot vinegar mix over the radishes, stopping to tap the jars firmly on the bench to remove air bubbles. Cover radishes completely with vinegar mix. Make sure rims of jars are clean and seal immediately. If you can stand it, leave for two weeks in the fridge for the flavour to really develop before serving… but it still tastes awesome straight away. Store in the refrigerator, for three months. 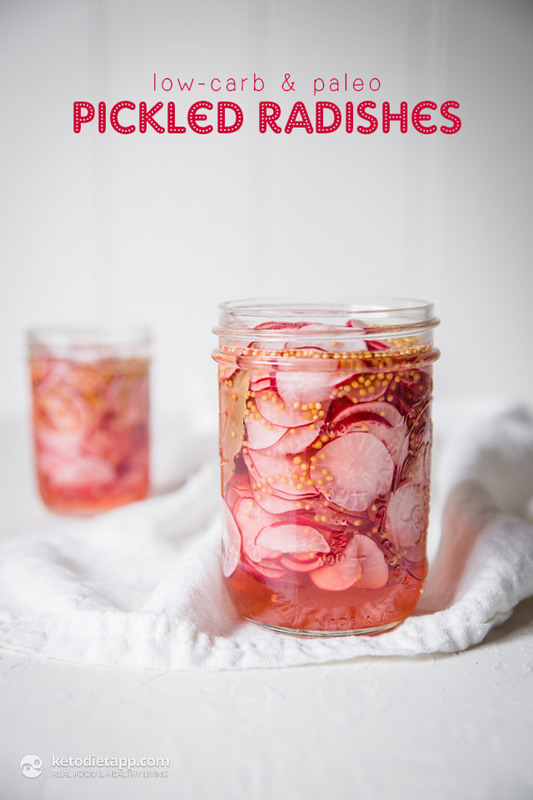 These pickled radishes are so delicious and addicitng. The longer they sit the better they taste. I try to always have a jar handy. Thank you for this recipe! 2 weeks on the counter & then refrigerate? Hi Cici, 2 weeks in the fridge before serving - thank you! These look lovely I will definitely make some jars of these once the radishes are growing in my allotment. Can i ask why do they need to be stored in the fridge and only last for 3 months? I make other pickles and store for up to a year in cool dark place, long enough until next years harvest! I thought the vinegar would preserve for a long time. Is there any way to make them last longer and not need to put in fridge as i would make a big batch? Hi Donna, it's 2 weeks in the fridge to intensify the flavour and then up to 3 months in the fridge. Just to be on the safe side, to make them last for longer, I preserve would them (canning method). I hope this helps! 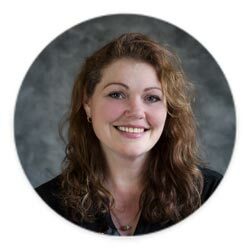 Donna - Note there are no sterilization instructions for the jars, ladle, lids, etc. Therefore, these won't last too long. If you want them to keep, then prepare as you do your pickles, i.e. 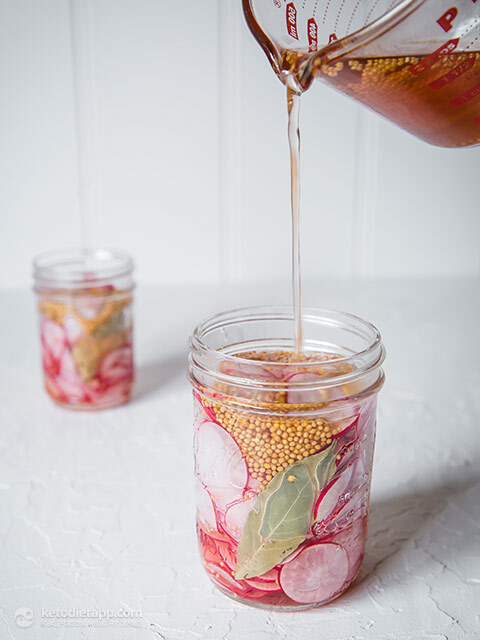 safe canning methods.